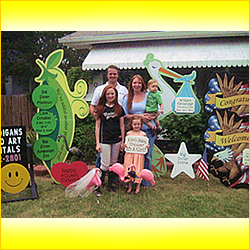 Yard art rentals for all special occasions! We offer exclusive 7 ft. Stork & Sweet Pea Birth Announcements and Military Rentals for Homecomings, Retirements, & Advancements! We also offer a yard full of Hearts, Smiley Faces, Pin Wheels, Tombstones, and/or Flamingos (Classic Pink and the popular Skel-a-Mingo) with personalized signage! Check out our Flamingos for FUN-raising too! Get creative and think outta-the-box for your special occasions including graduations, birthdays, retirements, proposals, engagements, showers, house warmings, anniversaries, reunions, and much much more! Keep checking our site as we add more Yardigans! Thanks so much for your support!